Just a hypothesis, but it may have to do with why the Saint was blind or when they were blinded. Some blind people keep their eyes closed all the time, but some, especially those that used to be able to see, keep them open. If that were the case, we would see icons of blind saints with either eyes closed or open, depending on whether their blindness was congenital or acquired. The iconographic record does not show this. St Matrona stands out as an exception, and a very recent one at that. The hymns to her all point to the requirement that she be portrayed with her eyes open. Iconography and hymnography go hand in hand. They are counterparts, the visual and verbal expressions of what we believe. The hymn you posted states that although she was blind her "spiritual eyes" were open. How can one depict spiritual eyes, without having them confused for physical eyes? Icons depict what is heavenly, perfected and transformed. As hymns to her attest, her infirmity was a blessing. I think you need to make up your mind. Also, a half-naked, emaciated crone with her ribs sticking out is your idea of heavenly, perfected and transformed? I see we're all enjoying our one small bowl of lukewarm Lenten gruel salted with tears. Many strive towards it, few will achieve it. The majority, including most non-monastics, have to "make do" with what I described. God can deal with us how He wishes. We are talking about an icon of Saint Matrona, not "the majority, including most non-monastics." In another thread you took issue with a supposedly monastic practice infiltrating parish practice. Now it seems you're attempting to impose a monastic practice on laymen. We are talking about an icon of Saint Matrona, not the average layman. As hymns to her attest, her infirmity was a blessing. Her physical eyes were useless, her spiritual eyes could see the will of God. That's a gift very, very few of us will receive. We are talking about an icon of Saint Matrona, not "us." Again, a very rare ideal. For the rest of us, icons and keeping our eyes open is a real help. We are talking about an icon of Saint Matrona, not "the rest of us". It has nothing to do with my own taste. Clearly it does. As is your wont, you are inventing rules and fabricating traditions to suit your personal taste. There is not a shred of evidence, from hymnography or iconography, to support your assertion. I'm content with what the Church has to say about this saint's spiritual gifts, which, in turn, should inform her iconography. Clearly you are not content with what the Church has to say, since you feel the need to pontificate on things the Church is silent about. The inner light of God is expressed by the halo around a saint's head, and, where this is carried out, by fine gold highlights on the saint's garments. Both are ancient and well-established ways of depicting this. Then there is no problem with Saint Matrona having her eyes closed, as long as she has a halo. Lex credendi, lex orendi. What I quoted from your posts were about prayer and how to pray, according to monastic practice. The rest of this post of yours is either grasping at straws or simply contradictory, contrarian for the sake of it. I have indeed provided evidence for why St Matrona should be shown with her eyes open in her icons, from hymns, history, and well-established iconographic principles. Why you choose to reject these is puzzling. What I quoted from your posts were about prayer and how to pray, according to monastic practice. On the contrary, painting Saint Matrona with her eyes closed shows her openness to a world beyond the senses. "Eye hath not seen, nor ear heard, neither have entered into the heart of man, the things which God hath prepared for them that love him." In instruction for prayer, Orthodox Christians are often advised to close their eyes, and generally to guard the senses. In a lot of saints' lives one is told that saint so-and-so despised the corruptible beauty of the world, and considered it not even worth looking at. So closing one's eyes can be easily inferred to signify withdrawing from the corruptible, transient, sensory world and entering the spiritual world. Yet the standard instruction for prayer is to pray in front of an icon, with one's eyes open, contemplating the icon and what it expresses. You then quoted my line about noetic prayer and tried to make this about imposing monastic practice on laymen. I could say the same about all of your personal quibbles disguised as "expertise." You have quoted a hymn that does not support your position. Also, something that LBK wrote a few years ago on another thread does not constitute "well established iconographic principles." I have not been inconsistent at all. I'll say it again: There is ascetic, and there is grotesque. That is subjective. What makes the "grotesque" example you provide grotesque? Leaving out the crone: half-naked, emaciated, +/- ribs sticking out, heavenly, perfected, transformed, describes ladies who make a lot of money walking up and down the runway. But which one does the Church venerate? How much of the difference is an East-West issue vs. a canonical one predating the schism? Jesus is depicted on the cross, and that implies suffering. The image developed from the Byzantine epitaphios image, which possibly dates back to the 8th century. A miraculous Byzantine mosaic icon of it is known as the Imago Pietatis or Christ of Pity. The work appears to have been brought to the major boy pilgrimage church of Santa Croce in Gerusalemme in Rome in the 12th century. Only replicas of the original work now survive. By the 13th century it was becoming common in the West as a devotional image for contemplation, in sculpture, painting and manuscripts. Orthodoxy depicts Jesus' body as exalted with arms straight on the cross, whereas Catholic icons show Jesus with sagging arms, showing his death and suffering. But is the sagging arms, cross-suffering, and death of Christ really heretical from a pre-schism POV? I'm not sure if the sagging arms stuff is heretical, but the straight-arms Jesus looks scary, in a good way, and impressive, all at the same time. He may be dead, but He is not going to be subject to gravity, because He's God. Even if I was not Orthodox, I would admire Jesus' combination of obedience to the will of God the Father, strength in the face of death, and utter unflappability that He displays in the Orthodox icons. I would understand why someone would be willing to die for a Man like that. All joking aside, the straight-arms Jesus looks cool. However, what made the saggy Jesus popular in the West? Maybe this artistic representation just reflected the broader spectrum of beliefs, i.e. the Christ-as-victim popular in the West versus the Christus Victor more prevalent in the East. Are there any other possible explanations, considering that the straight-arms Jesus who is (relatively) alert is present on quite a few western crucifixes as well (the Santa Chiara church cross is one example)? The degradation of the body, whether through age or mortification, is a mark of corruption. Likewise grey hair, however it might be used to connote wisdom, is a sign of senescence and therefore traceable to the fall. If you want to say, "But Saint Mary's wizening is meant to highlight her spiritual struggle in the desert," or "Saint Elijah's grey hair represents his wisdom," fine and good, but these outward traits still only occur naturally from the corruption of the body. And if traits associated with natural corruption can be used to express spiritual perfection, then this opens the door to spectacles, blindness, and all the other characteristics you are trying to rule out. Saint John Maximovitch's spectacles, for instance, can be taken to represent his diligence in reading and his scholarship. The way I see it, even if LBK's interpetations of iconography are as arbitrary as you suggest, they are no more arbitrary than many aspects of the Faith, such as the canon of Scripture, the ecumenicity of councils, and the canonicity of Saints. I'd say there's quite a bit of difference between decisions promulgated by synods of bishops and the incoherent opinions of an anonymous individual pretending to be an expert on an Internet forum. I don't know about the Victim/Victor distinction; the Latin Church means "victim" in the sense of "sacrificial offering." I think it has mostly to do with Latin soteriology. In the second millennium, the dominant idea came to be that it was Christ's suffering alone that was redemptive, that "paid the price" to appease the wrath of the Father; the Resurrection is simply the fruit or reward of this act. The Eucharistic sacrifice is understood chiefly in terms of a re-presentation of the Passion; the idea of the "heavenly banquet" is very secondary, and the act of the sacrifice being re-presented is more important than Communion. 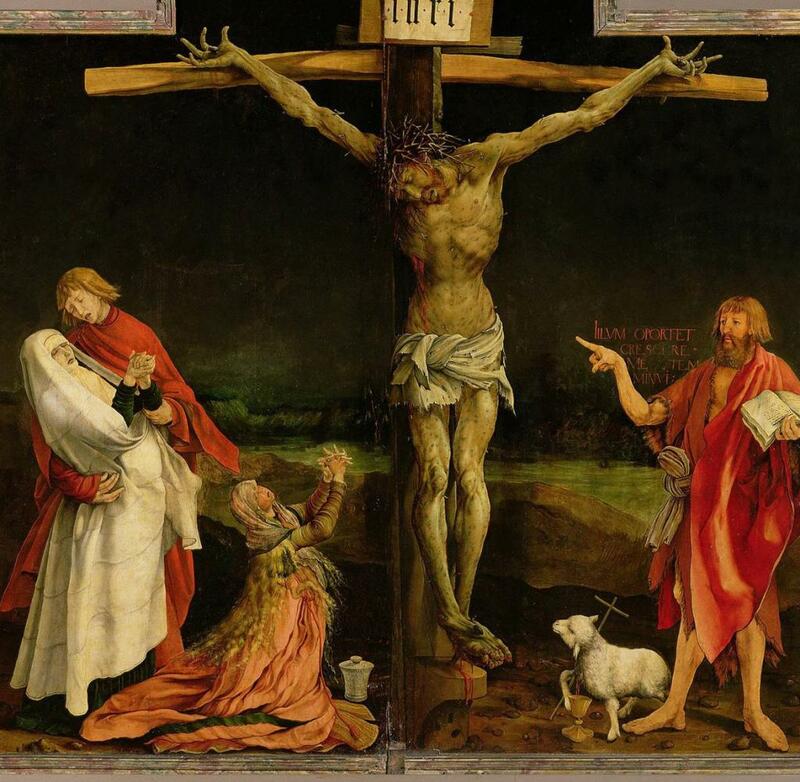 With suffering being the primary redemptive action, it is not surprising that scenes of the Crucifixion came to emphasize it, to the point of some of those ghastly Spanish crucifixes or The Passion of the Christ. And those decisions, when applied the same criterion of skepticism consistently, would lead me to believe that the Bishops are also incoherent. I'm not trying to equate the authority or credibility of the Synods with that of LBK, but rather to suggest the possibility that unwritten rules of iconography might exist, just don't necessarily conform to our modern-day standards of logical consistency. Sure, unwritten rules of iconography may very well exist; they would probably be best embodied in the iconography itself, which continually defies the rules that LBK attempts to impose on it. In your opinion, if an icon in question has a historical and traditional background, is that enough to prove that the icon is canon or acceptable? It should give the detractors pause, but no, it does not prove conclusively that the image is acceptable. But if someone wants to argue that it is not acceptable, there has to be some coherent reasoning, backed by tradition. Saying simultaneously, "Grey hair is fine, because it symbolizes wisdom" and "Eyeglasses are verboten, because they are marks of bodily degradation" is nonsense. 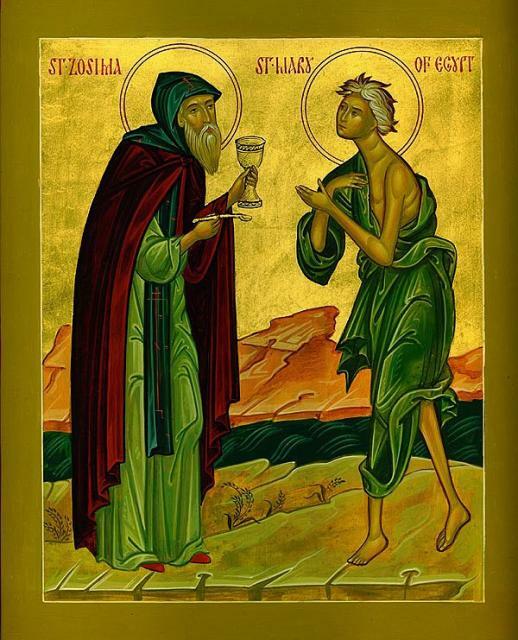 I want to see an icon of St. Mary of Egypt noetic, yet pre-ascetic looking, if you know what I mean. Is this like the time JamesR daydreamed (nightdreamed?) about a romantic relationship with one of the Russian royal martyrs? Kind of. Egyptian > Russian, IMHO. So much hotta. Saying simultaneously, "Grey hair is fine, because it symbolizes wisdom" and "Eyeglasses are verboten, because they are marks of bodily degradation" is nonsense. I suppose it can be argued that the ancient world and the early Christians have interpreted gray hair in a positive light, while the same cannot be said for imperfections in the eye. So just because one can interpret the latter in a positive way, doesn't mean that's the traditional Orthodox interpretation. And what, pray tell, is "the" traditional Orthodox interpretation? What would make you think that, in an ancient, multi-faceted, complex religion like ours, there would be a single traditional interpretation on every peripheral question of iconography? Analogically, if an emaciated, withered frame can be depicted as a token of ascetic struggle (suggesting a spiritual beauty and robustness acquired thereby) then spectacles or blindness can be signifiers of mental strength or spiritual vision. 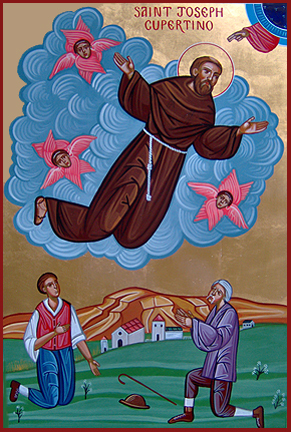 When Saint Anthony visited Didymus the Blind, he is reported to have said, "Do not be sad that you have no eyesight with which the animals, and even the insects, share, but remember that you have divine insight with which you can see the light of divinity." I don't know, as I don't have a dogmatic opinion either way. I'm playing devil's advocate, but only to see if I can get an adequate refutation to those arguments, so that I may make an informed opinion. That said, just because there are multiple interpretations from the Fathers on many questions, doesn't mean that there are no correct answers to any of them. To argue otherwise would be metaphysical relativism. What you can argue, though, is that answers are not clear and are difficult (if not impossible) to discern, and that consequently, we are under epistemological relativism when it comes some questions of theology and iconography. Analogically, if an emaciated, withered frame can be depicted as a token of ascetic struggle (suggesting a spiritual beauty and robustness acquired thereby) then spectacles or blindness can be signifiers of mental strength or spiritual vision. From a purely logical standpoint, that makes sense (just as any artwork can be interpreted to mean anything, if one is creative enough), but it doesn't necessarily mean that that's how early Christians have traitionally saw it. 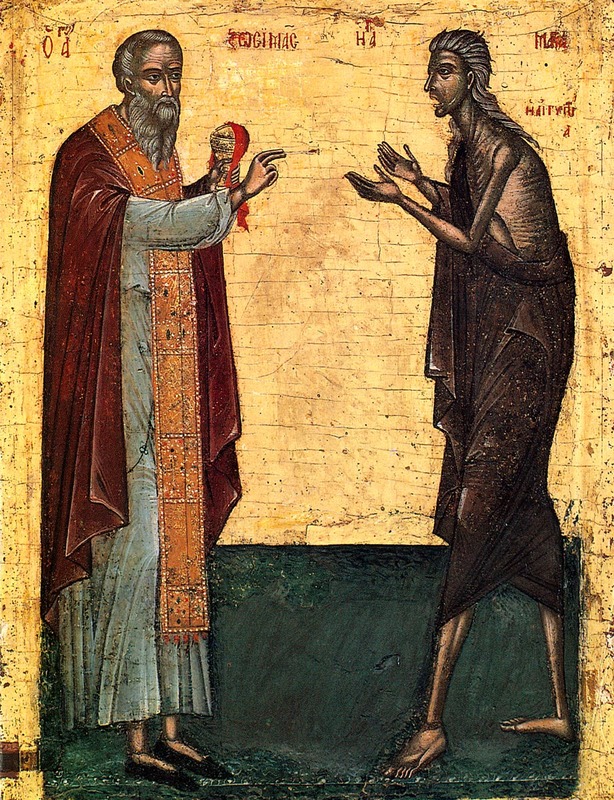 When Saint Anthony visited Didymus the Blind, he is reported to have said, "Do not be sad that you have no eyesight with which the animals, and even the insects, share, but remember that you have divine insight with which you can see the light of divinity." Did St. Anthony believe that Didymus had divine insight because of his blindness, or in spite of his blindness? The difference has massive implications on whether it substantiates your point. What you can argue, though, is that answers are not clear and are difficult (if not impossible) to discern, and that consequently, we are under epistemological relativism when it comes some questions of theology and iconography. I think it just goes back to what I said before- in art, it is possible to convey the same truth in multiple, sometimes seemingly contradictory ways. I wouldn't say that's a matter of epistemological relativism and more of poetic sensitivity. In any case we do not have sufficient answers in tradition to provide any solid ground for many of the rules about iconography being floated around here. From a purely logical standpoint, that makes sense (just as any form of artwork can be interpreted to mean anything in the universe, if one is creative enough), but it doesn't necessarily mean that that's how early Christians have traitionally saw it. My point was not that that was how early Christians saw it. LBK promulgates rules and then justifies them, not on the basis of tradition, but her own personal reasoning. If personal reasoning is sufficient to elaborate iconographic rules, then my argument is just as valid as hers. Which doesn't change the fact that St. Anthony implicitly saw physical blindness in a rather handicapped sort of way...unless one can substantiate that St. Anthony believed that Didymus had divine insight because of his blindness, not in spite of his blindness. It fits in with the general outlook of the spirituality of the desert fathers, the Philokalia, etc: withdrawing from the senses and approaching divine realities without the mediation of images. In fact a proper understanding of the created world itself is only possible through such a withdrawal. Not that one has to be blind to do this, but it is one striking way of highlighting the suprasensual character of theology. Going to the hagiographic and hymnographic texts associated with Saint Matrona of Moscow, mentioned earlier in this thread, one encounters the idea that her blindness and weakness were given by God as a means of developing her spiritual gifts. All of this typifies the attitude toward the senses in Orthodox spirituality- that, while they are good and useful, they must be transcended in theology. The presence of saints who are physically blind but have profound spiritual insight is one way of illustrating this. It should give the detractors pause, but no, it does not prove conclusively that the image is acceptable. But if someone wants to argue that it is not acceptable, there has to be some coherent reasoning, backed by tradition. Fair enough. I agree that in such cases, the burden of proof shifts to the detractors. Thank you. You make some good points. What could a cane mean? Would have been trippy I think if Jesus also had his arms raised. I guess that wasn't what they were going for though. And the dove's wings outstretched! With flames! And the Apostles receiving the Holy Spirit! And Kosmos breakdancing in the middle! And something inside the baby Jesus, an icon of the Father raising his hands up. For funzies, don't get all bent out of shape. The Terminator (Arnold Schwarzenegger movie). The top phonetically says "I'll be back," a line from the movie. We should definitely unteach Latin Catholics on how to paint icons. The "icon" makes me laugh at least. Why? St Joseph of Cupertino is famous for levitating. 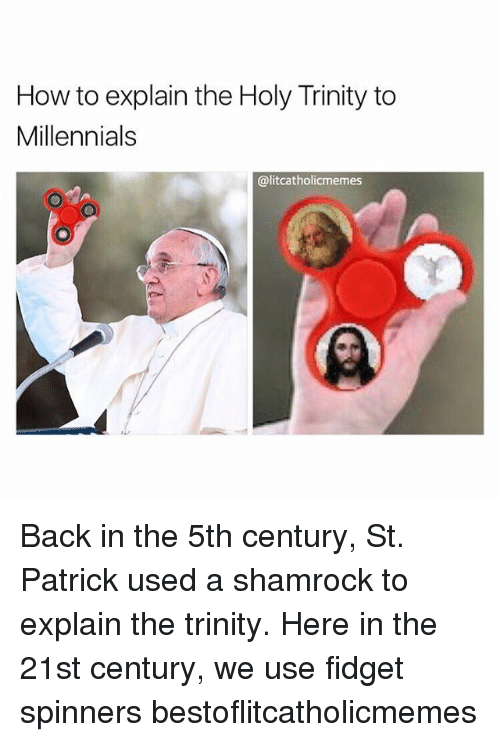 Does anybody here do any research before commenting on Catholic saints?